VietNamNet Bridge – Dr Tran Thi Cuc Hoa and her colleagues have researched and developed two rice varieties that have been widely planted by Vietnamese farmers. Director of the Agricultural Genetics Institute (AGI) Dr Le Huy Ham said Dr Hoa from the Mekong Delta’s Rice Research Institute (MDRRI) created a dozen rice varieties, including OM6976 and OM5451, that have become main rice varieties in the Mekong Delta. Hoa and her colleagues Dr Pham Trung Nghia, La Cao Thang, Dang Thi Tham and Huynh Thi Phuong Loan, had invested nine years into researching these varieties that brought economic benefits to the nation, said Ham. Dr Tran Ngoc Thach, director of the MDRRI, said the project is significant because it had been carefully researched to create rice enriched with folic acid and zinc. The two varieties are widely planted in the Mekong Delta, which produces half of the country’s rice output and 95 per cent of rice for export, according to Thach. “They help to increase rice production and exports while increasing the competitiveness of Vietnamese rice in the world market and the income of our farmers,” Thach said. They can also be planted year round in coastal regions. “They have become the main high quality varieties in the delta, remarkably contributed to the country’s export of rice,” Thach said. During 2013-15, farmers in Hau Giang, Ca Mau, Vinh Long, Bac Lieu, Kien Giang and Soc Trang provinces planted three million hectares with a yield of 5.9 tonnes per ha, and an average price of VND6,300/kg, bringing profit of VND2.97 million per hectare more than other rice varieties, said Thach. Farmer Nguyen Van Ngo in Kien Giang’s Binh An Village said thanks to high adaptability of these varieties to alkaline and saline soil, his field yields 1.2 tonnes per cong (each cong is about 1,300sq.m). 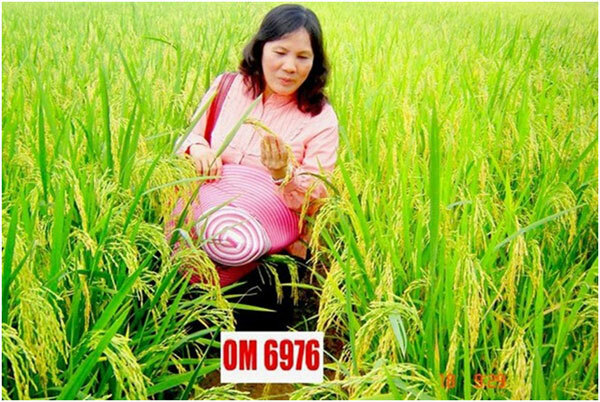 To have these new rice varieties, Dr Hoa and her colleagues created thousands of cross breeding complexes for nearly a decade, for example, to create OM6976 from cross-breeding four different parents. Hoa has researched cross breeding to create rice strains adaptable to climate change and with high yield. “This new rice variety that can grow on saline soil is expected to be planted en masse very soon,” said Hoa. Apart from these rice varieties, Dr Hoa researches gene technology of plants to prevent changes of gene in cotton plant, soybean and rice, according to Dr Thach from the MDRRI. Hoa is researching gene-change of soybean varieties that are resistant to pests in a project ordered by the Ministry of Agriculture and Rural Development. As a result, her research work was awarded a State prize, and is among the country’s eight outstanding works at the "Viet Nam Glory" programme held by the Viet Nam General Confederation of Labour last week. Furthermore, more than 80 research articles written by Hoa have been covered by local and foreign magazines. But Hoa said she was very happy when people “call me the scientist of farmers because I’ve been working with them in the field, often for days”. Hoa was born in the southern province of Binh Dinh in 1955 and worked in the MDRRI since 1980, after graduating from the HCM City University of Science. She studied in India’s Agriculture Researching Institute, the US Purdue University and the Technology Institute of Switzerland.